Wed., March 7, 2018, 6:05 p.m.
LAS VEGAS – Reid Travis had 19 points and 13 rebounds, helping Stanford roll over rival California 76-58 in the first round of the Pac-12 Tournament on Wednesday. 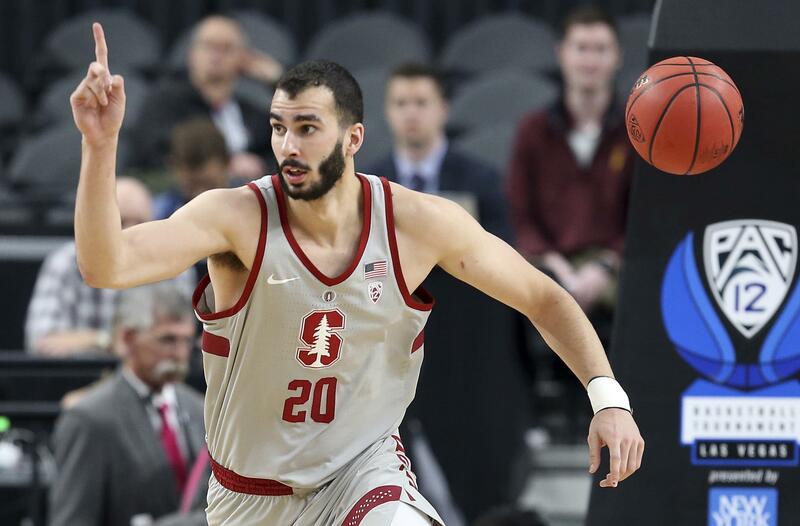 Stanford (18-14) shot well early to build a double-digit lead and shut the Bears down defensively to earn a spot in Thursday’s quarterfinals against fourth-seeded UCLA. The fifth-seeded Cardinal held Cal to 28 percent shooting and had a 30-18 advantage in the paint. Travis hit 7 of 11 shots and Dorian Pickens scored 16 points. No. 12 seed Cal (8-24) closed out a difficult first season under Wyking Jones with its seventh consecutive loss and 16th in 17 games. Darius McNeill led the Bears with 19 points, making 5 of 10 from 3-point range. The rest of the Bears combined to go 2 of 15 from the arc. Cal won the opening game between the rivals during the regular season, beating the Cardinal 77-74 at The Farm for one of its two Pac-12 victories. Travis did most of the damage early in round three, scoring 11 points by the midpoint of the first half as Stanford built a 12-point lead. Travis had 13 points by halftime and the Cardinal led 39-28 after hitting 16 of 29 shots. Stanford didn’t let up in the second half, extending the lead to 63-39 behind Travis and Pickens. Published: March 7, 2018, 6:05 p.m.